Emotional connection is something we do every day. Mother's Day is no exception. Do something to make your mom feel loved and appreciated. Building connections in our lives is what the life is about. We are social creatures and crave connecting on a deeper level than just being all by ourselves in this world. Connecting to another individual has a powerful reverberation on our own well-being, physical and psychological. When we belong to a network of connected individuals, we feel empowered and creative and self-fulfilling. And how do we know that we are connected or are connecting to other human being? The examples are all around us. These examples are in millions. What unites and binds them together is our emotional output we share during each and every one of them. It is called the ability to understand and share the feelings of another. EMPATHY. EMPATHY, noun – the ability to understand and share the feelings of another. ‘In-Feeling’ – How beautiful it is, isn’t it? When we exercise empathy on the daily basis, with each interaction we encounter, we are building strong connections that translate in fruitful and emotionally rewarding relationships. Whatever we do in life, taking a moment to connect – to feel empathic – could create a life for us and others colored in million hues of emotions and our rich feelings. This coming Mother’s Day, do something to connect with your Mother or MOM figure in your life. Let’s say ‘Thanks’ to these women who spared nothing to bring us into this world and give all the best they could. No matter what you choose to do to connect with your MOM, feel the vibration of your soul wanting to do it because she is the one who loves you unconditionally. 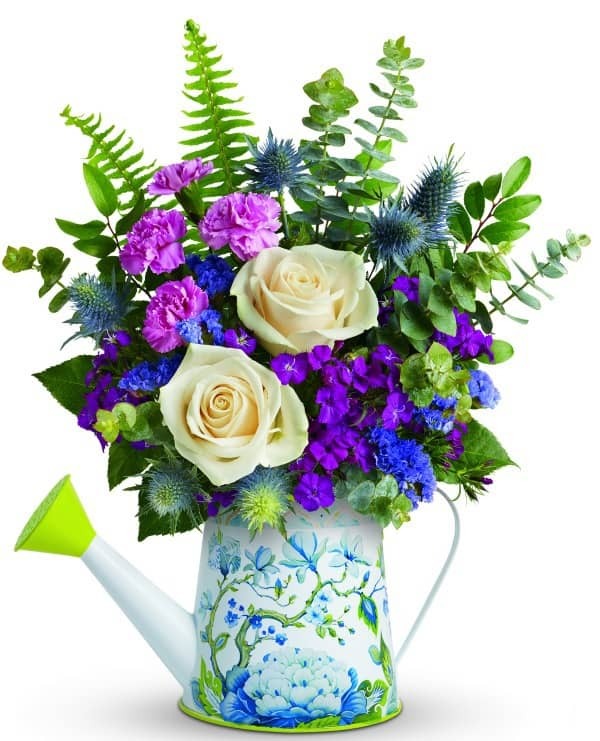 Teleflora makes a beautiful gift idea guide every season. 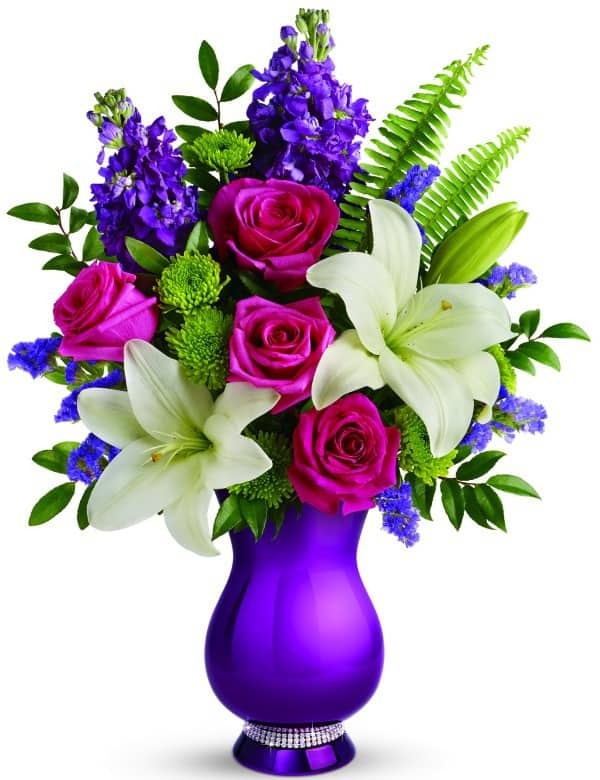 And when it comes to our MOMS, any floral bouquet they design is a spectacular show of vibrant colors and unique vases. 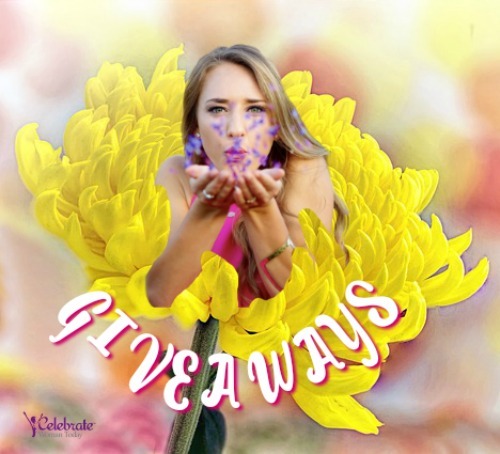 Check out these bouquets below and be ready to win one of yours! Bold and beautiful, just like mom. 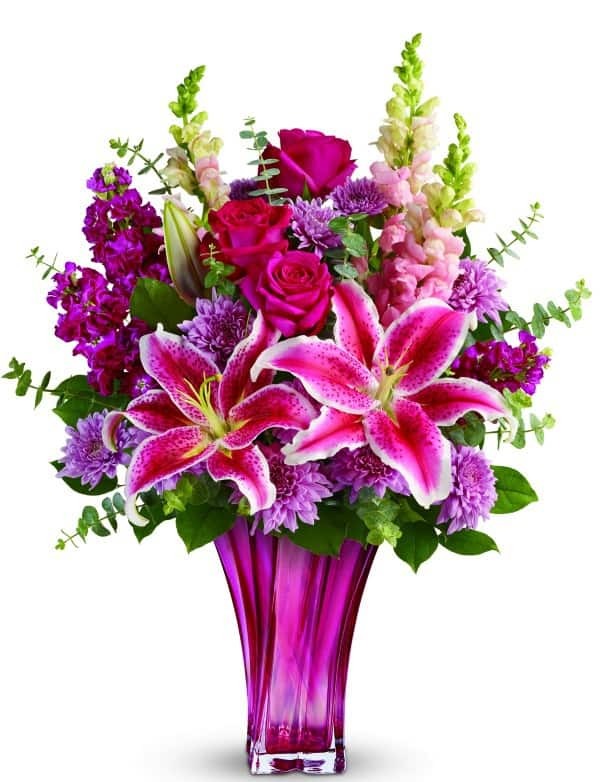 Pamper the ‘best mom in the world’ with this decadent bouquet brimming with hot pink roses, vibrant pink stargazer lilies, snapdragons, and lavendar cushion spray chrysanthemums artistically-arranged in an elegant, fuchsia blown glass vase. Just like mom, handmade bouquets light up a room… so make her heart dance with this fun and pleasing purple and white bouquet filled with lavender and white daisy spray chrysanthemums, purple carnations, and a medley of other floral accents. 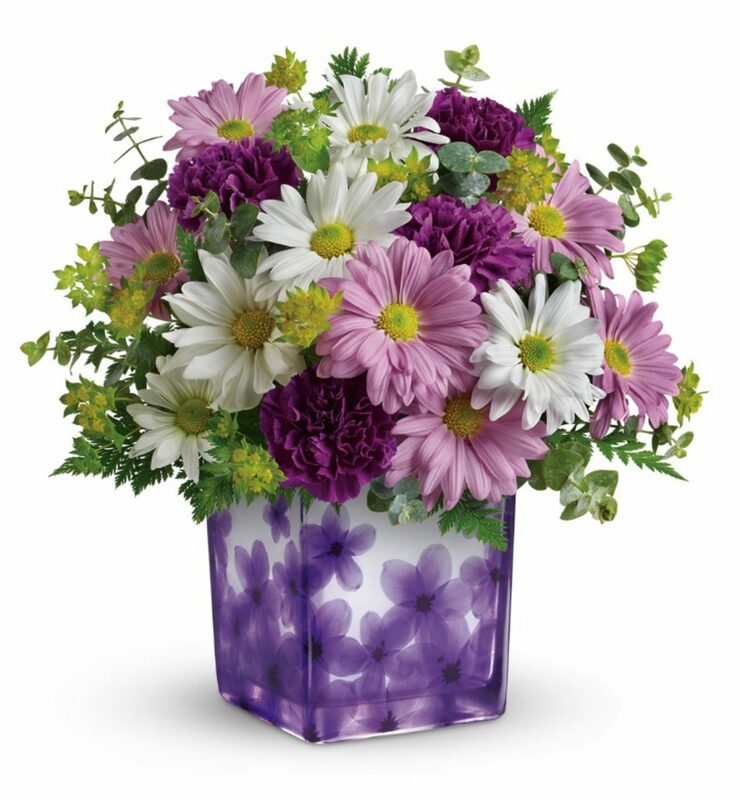 This beautiful floral arrangement is displayed within a purple glass cube vase with a pretty pressed violet design. 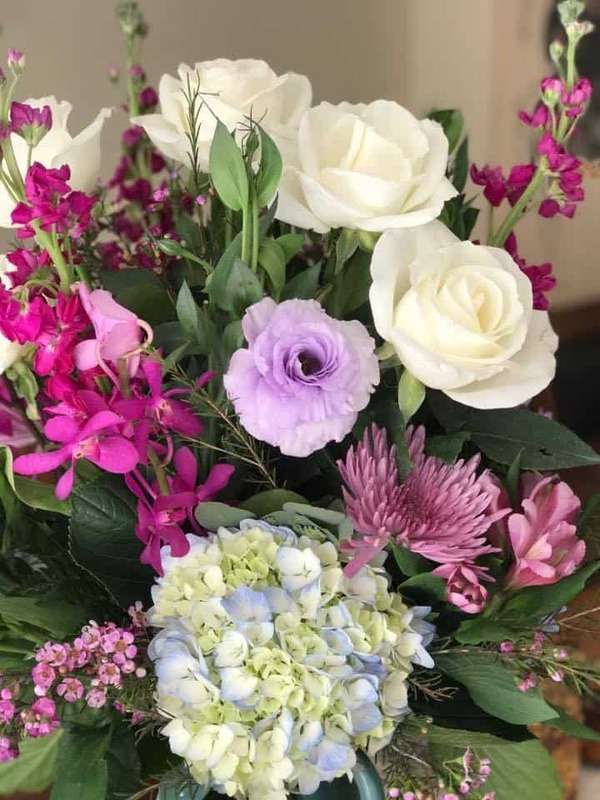 Just like mom, this delightful garden-inspired Mother’s Day floral arrangement will deliver a heartfelt smile across the miles. 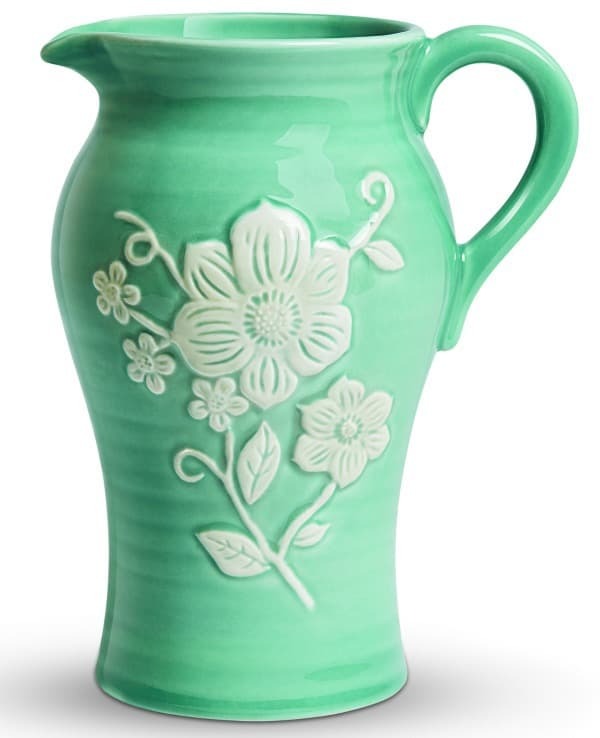 As a long-lasting keepsake, mom will enjoy its sweet watering can that features a hand-painted, vintage botanical print. This was my choice of Mother’s Day bouquet. Sweet and lovely, just like mom. Send her this pretty 2-in-1 gift that arrives as a fanciful mixed bouquet filled with crème roses, lavender alstroemeria, and chrysanthemums nestled within a hand-painted, floral embossed stoneware pitcher; FDA-approved to safely serve and store food, microwave and dishwasher-safe. The blooms are huge in this bouquet! Made in Portugal, this gorgeous pitcher is actually safe for food! They specifically mention it in the description of this item. I think this type of vase adds some uniqueness and warmth to any bouquet that will be sitting in this pitcher! Celebrate Your MOM This Day & Every Day! Carving Out Quality Time With My Love, YES PLEASE! And Konifer Will Help! Who Wants To Shower Their Valentine With TELEFLORA Flowers? Those flowers look so beautiful! I have never ordered anything from Teleflora, sounds like a great place to order bouqets. These bouquets are relly beautiful. and colourful. A great way to express your feeling for your mom. Mothers are so much like flowers. Beautiful and give so much without any expectations. I have to admit I love getting a bouquet of flowers and there is something really nice about the inclusion of the pitcher. My mom loves getting flowers for any occasion (don’t we all). I’ll have to find her a pretty bouquet to send to surprise her. These are just gorgeous. My mom would love these bouquets. She may not openly appreciate it because she would always say, “they’d wilt anyway,” but I know deep inside, she loves receiving flowers. She wouldn’t spend all that time in her garden caring for her flowering plants if she did not care for flowers, right? Empathy is something that this world need more. Thanks for this timely reminder. Happy Mother’s Day to all the mothers! Spring is flying by, I cannot believe Mothers day is just around the corner. All of these flowers are beautiful! I love getting flowers for any occasion. 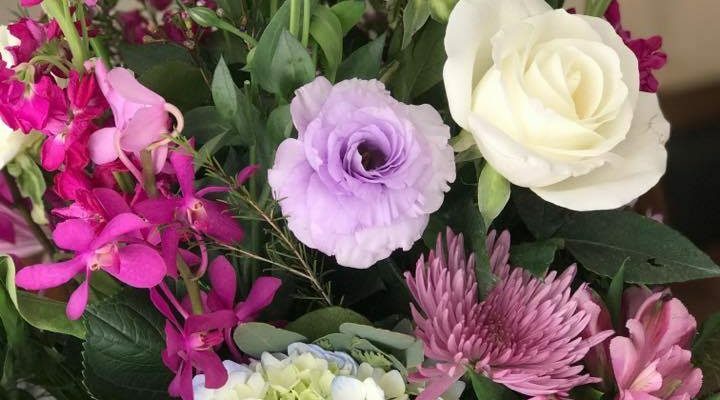 These are all beautiful bouquets and they are perfect for Mother’s Day! I love the Splendid Garden bouquet the most I think. I love flowers especially pink roses. I also love telefora’s vases that can be reused. I love the colors on the Sparkle and Shine bouquet!!! So pretty! I have not gotten a gift yet for my mom for Mother’s Day and will have to get her some pretty flowers!!! This reminds me to send my mom a bouquet of flowers. These are really wonderful setup. I love all of these bouquets! They are so beautiful! I really should get one of these for my mom this year. I bet she would love it. I LOVE Teleflora. Their colors and combinations, and their messages and outreach. Great company. I used to order my grandmother flowers every year when she was alive. Now I order them for my mom! My gosh there are so many beautiful choices here. I think my favorite is the Teleflora sparkle bouquet. I will have to tell my husband about these flowers. Those are all such beautiful choices! I know I could find a perfect bouquet for my mom from Teleflora! Sending flowers is such a thoughtful way to show someone how much they meant to you. 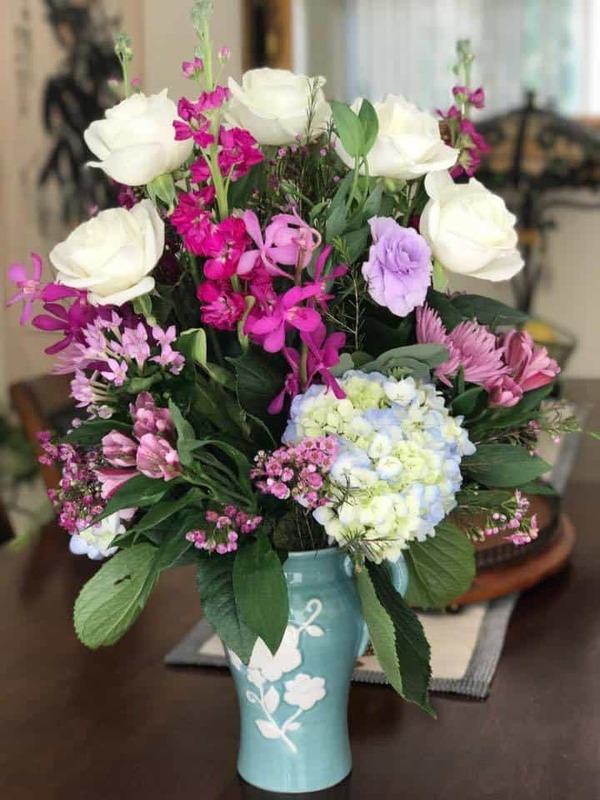 I’ve send Teltflora bouquets to a few people and they really thought Teleflora did a wonderful job. I love all different types of flowers, all really beautiful. My mom was a great flower lover. Now I more into the wildflower bouquets and it is great to see more of these showing up and available. I always got my mom flowers for Mother’s Day. This year I will get her a smaller bouquet for her place at the cemetery. These are some stunning flowers! I love all the bold colors and the beautiful vases too. These are such beautiful bouquets to consider for mom on mother’s day. and yes, I enjoyed the thoughts of being sympathetic and enjoying each other every day. This is so thoughtfully written. So gorgeous. I am a huge fan of flowers, especially on mothers day. if my mom were still with us I’d for sure include some in her gift. Flowers always make a perfect gift! These Teleflora arrangements are stunning. I need to plan a flower delivery for my Mom next month, thanks for the reminder. Such beautiful flower decorations. I would love to buy one of those decorated flower to my mom on mothers day. Indeed mother’s should receive something special on mothers day. These are beautiful boquets. I definitely thank you for giving me some great ideas of what I would like to do for Mother’s Day. I would send flowers, but I’ve decided to send a print I found. This is my first mother’s day away from home and I’d like her to have something to keep this time. Those are gorgeous bouquets! I’m sure that any mother would be excited to receive one! Teleflora always has the most beautiful bouquets. The green pitcher is really lovely! These are absolutely beautiful! Just in time for Mother’s Day too next month! My mom loves flowers and her favorite color is purple too so these would work great! These are beautiful bouquets! I love that they are all full of amazing color and the ability to order these so easily is definitely something I love! This is perfect .. every year I send my mom a big bunch of flowers on Mother’s Day! Loving the arrangement with the big blooms .. they’re dramatic and pretty just like her! 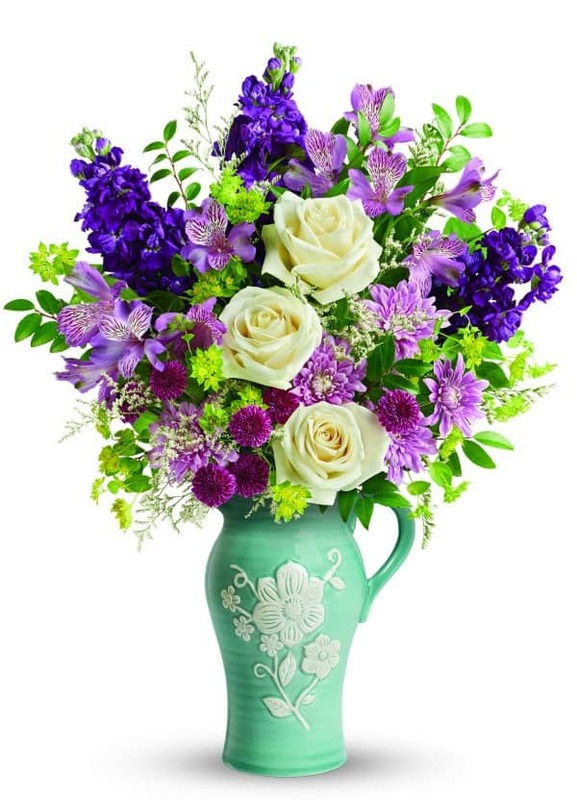 The Teleflora Splendid Garden Bouquet is gorgeous! My mom would love that (and me too)!